The unseededed U.S. pairing of Sloane Stephens and Mallory Burdette went 1-1 in doubles matches Friday, reaching the finals of the US Open junior championships, but having no time to enjoy it, as the semifinals and finals were played on the same day due to the threat of tropical storm Hanna. After defeating the No. 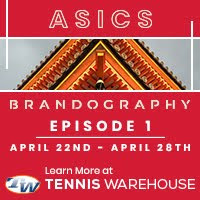 5 seeded team of Richel Hogenkamp and Arantxa Rus of the Netherlands 7-6(2), 6-3, Burdette and Stephens had only a brief break before taking on the third-seeded team of Noppawan Lertcheewakarn of Thailand and Sandra Roma of Sweden Friday evening. 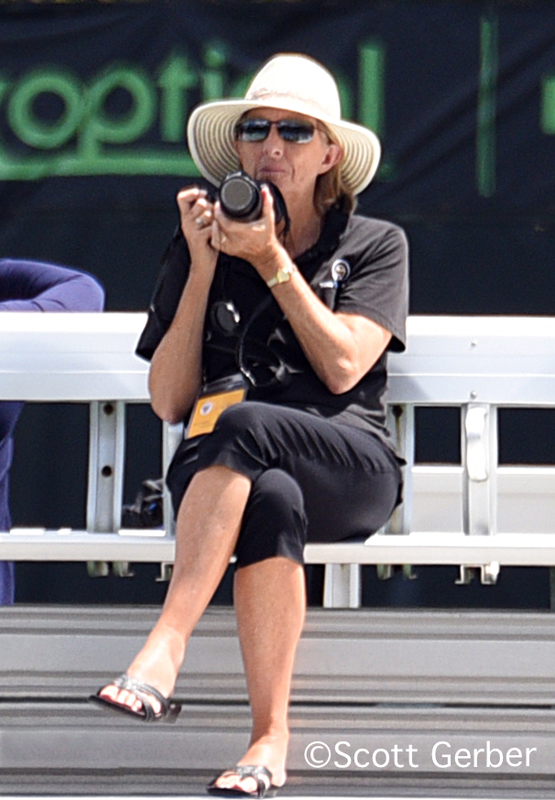 Much to the disappointment of those specatators who stopped by after witnessing Serena Williams's win over Dinara Safina, Burdette and Stephens, who both train with Nick Saviano, could get nothing going in the finals, falling 6-0, 6-2. 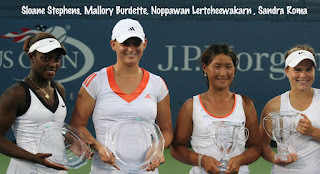 "Making the finals was great," said Burdette, "especially since this was our first Grand Slam playing doubles together. The girls we played played amazing and there was really not much that we could do, so you've just got to hold your head up." "It's been a long week," said the 15-year-old Stephens, who also won a match in women's qualifying and in mixed doubles. "We've had some good matches and we've done pretty well. It's been a great opportunity, and I'm just happy we made the finals." 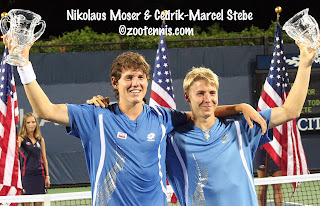 In the boys doubles finals, the capricious nature of the 10-point tiebreaker was brought to the forefront, when a net cord winner on match point gave the U.S. Open boys doubles title to unseeded Nikolaus Moser of Austria and Cedrik-Marcel Stebe of Germany 7-6(5), 3-6, 10-8 over No. 2 seeds Henri Kontinen of Finland and Christopher Rungkat of Indonesia. Kontinen and Rungkat, the French Open Junior champions, were up 4-0 in the final tiebreak, but Moser and Stebe leveled it at 4-4. At the second change of ends it was 6-6, and four points later it was 8-8, with the next point of utmost importance. Stebe banged a service winner to set up match point, and with Rungkat serving, Moser's return clipped the netcord and bounded past the net-rushing Kontinen and Rungkat, dropping well inside the baseline. In the blink of an eye, a Junior Slam was decided, with Moser and Stebe raising the trophy thanks to that fortunate bounce.